Accompanying MCK volunteers Inge and Sarah to Cipto today was Cilla, from the British Women’s Association. We were delighted to show Cilla first hand how their valuable donation is used at the hospital. On our visit to the Cancer Ward we met with Dr Endang, who showed us the new playground that has been built within the temporary hospital ward for children with non-infectious diseases to enjoy. 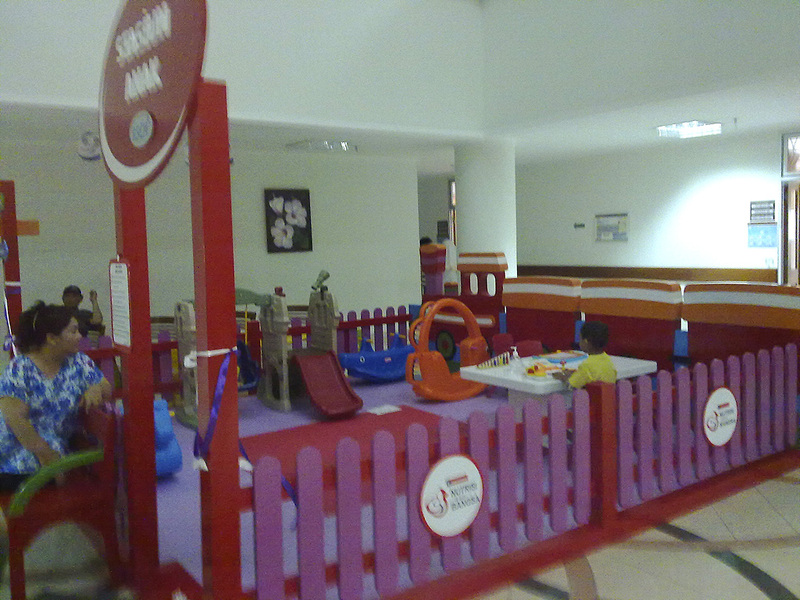 This fantastic playground area was sponsored by an Indonesian company based in Jakarta. Dr Endang updated us on how Nani (14 years old) is doing. At our last visit Nani had undergone many tests to establish the stage of the cancer in her leg. At a meeting on Monday of this week, it was decided that the tumour is now too big and that Nani must have her leg amputated. A heartbreaking outcome for Nani, but a necessary one, to stop the cancer from spreading further. After the operation, which is yet to be scheduled, Nani may receive chemotherapy. From everyone at MCK, we wish Nani all the very best for her forthcoming operation, and hope that we will meet one another soon. Dr Endang also showed to us a very quiet out-patients clinic today – or so we thought. Many patients were having tests completed across the hospital and the nurses and doctors were waiting for them all to return. This outpatient clinic for children sees over 70 patients a day! We also visited the Neo-natal ward today and were extremely privileged to meet the newly separated conjoined twins! The twins were in their own incubators in an isolation ward so we were able to see them from afar. The doctors reported that the operation was extremely successful, and although one twin has a problem with the heart, their prognosis is very good. 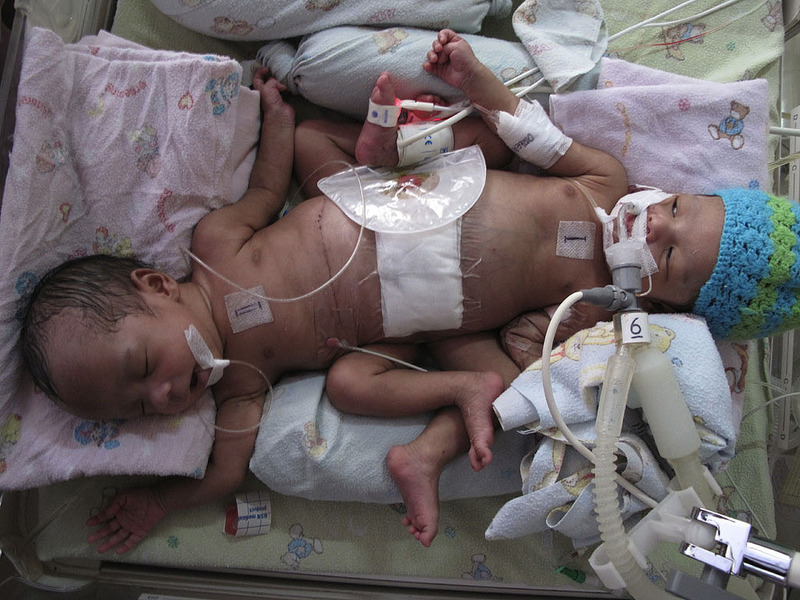 We also met with the conjoined twins that arrived at the hospital just after our last visit. We were unable to take pictures at this time, a shame because words cannot describe how strong, healthy and happy the twins look. We wait on news from the ward regarding these babies. On the special care ward we met with Ny Arianti who has a blockage somewhere in her intestines – a difficult case for the doctors as the baby has already had one operation to resolve the problem and it looks like more will come. And Ny Alif, with thyroid problems as such a young age. This little one was very distressed today and because of a tracheotomy cannot be given a pacifier to help him soothe. We wish both babies lots and lots of love and hope that their conditions improve very, very soon. Our next visit to RS Cipto will be after the New Year, so we wish everyone on the wards, the doctors and nurses, the children and their families, a peaceful holiday period. MCK volunteers Monica and Sarah visited the children, families and doctors at Cipto twice in the last two weeks. The first was a regular visit when our volunteers were accompanied by one of our valued sponsors based in Jakarta. We spent a great deal of time with Dr Endang, visiting her Children’s Oncology outpatient’s unit and also the Emergency Room. The children’s outpatient unit sees up to 70 children a day for various medical reasons, and particularly for Dr Endang’s patients, to receive chemotherapy. We met a very shy young boy and his family, who is suffering from a tumour in his neck. His father told us the little boy is number 6 out of 7 children and through help from the government insurance scheme and MCK, his medical costs were being covered and he could continue to get treatment for his son. This timid little boy did not want his name to be known or his photo to be taken. We were also privileged to spend time with Dr Rina, head of the Neo-natal ward, where we visited the babies. The doctors and nurses on the ward were very busy deep cleaning each ward to clear the rooms of an infection that took hold recently. We were able to view beautiful new-born conjoined twins. The doctors are hopeful for a separation as the babies are joined head-to-toe at the stomach. Amazingly the doctors were waiting on more conjoined twins to arrive on the ward. The second visit was to meet with Nani, a 14 year old girl with a tumour growing in her leg. Nani was introduced to MCK via one of the international organisations in Jakarta. Nani lives with her elderly parents outside of Jakarta. Nani’s neighbour was desperately searching for help to get this poorly young girl to a hospital to receive treatment but together they could not afford to pay for the journey to Jakarta, let alone treatment for her. Happily MCK, along with the St Patricks Society Jakarta, are able to help Nani get the treatment she so desperately needs. Nani has spent the last week having many tests completed and we wait to hear what Nani’s course of treatment will be. Unfortunately we did not get to meet Nani at this time as she was resting at a homestay nearby. We’ll see you next time Nani, lots and lots of love and luck to you and all of the children and their families that we meet every time we visit the hospital. MCK volunteers Haidi, Inge J and Sarah visited Cipto again last week. It was a visit of mixed emotions, meeting some very poorly children in extremely difficult circumstances, yet hearing of others that had previously been helped and were now on their way home, like Isyabella. She was discharged from the Infectious Ward, a healthy girl again after spending a month on the ward being treated for Common Bile Duct Cysts. We also visited the newly built areas of the Neo-Natal Ward, which will offer a modern unit to maternity and baby care at the hospital. Our first stop was the incubators on the Neo-Natal Ward, where we met the twins. Still unnamed, they were born at 31 weeks and are now 1 month old. They are both suffering from Sepsis, one has stomach issues, the other has liver problems. They are currently in separate incubators. Their situation, and that of their family, is harrowing, being born to a 15 year old mother who was raped. It is likely that the twins will go to a state orphanage when they are well enough to leave the hospital. Another little boy born early is the son of Ny Aia, he also has Sepsis. When we met him last week he was but 1 week old. His mother is homeless. 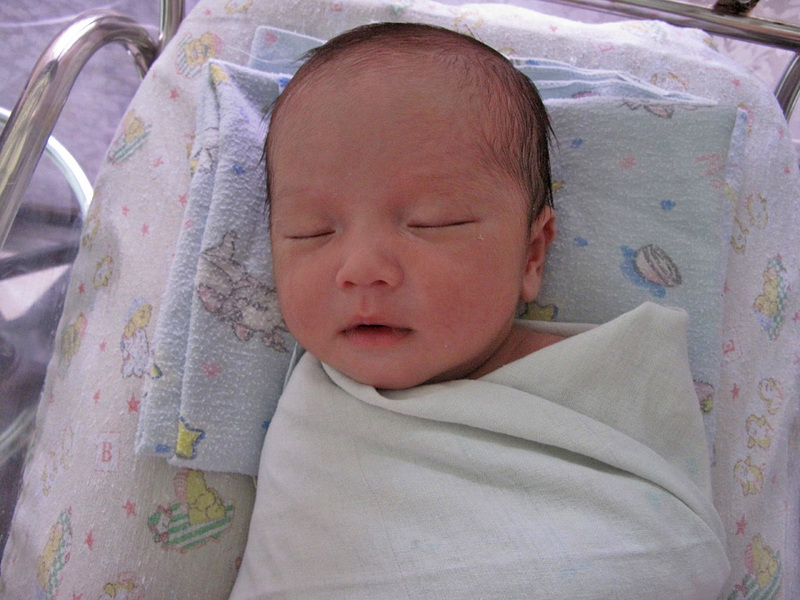 And M. Rizky, born at 28 weeks, needs to have an operation for a heart defect. He has to wait until he weighs 1.8kg before the surgeons will operate – he currently weighs only 1kg. His parents are destitute, living by the railway line in Jakarta. They cannot even afford to come and visit their little boy. Lastly we met the child of Ny Aulia, born just 11 days before our visit. This little one has many complications, including cleft palate, facial deformities, a heart defect and the organs of both a male and a female. The doctors are currently deciding on the best care plan and MCK will help with the treatment. Next we visited the Cancer Ward, where we met two new patients, Fauzi and Nur Oktavia. At 15 and 16 years old Fauzi and Nur Oktavia are the oldest children on the ward at the moment. 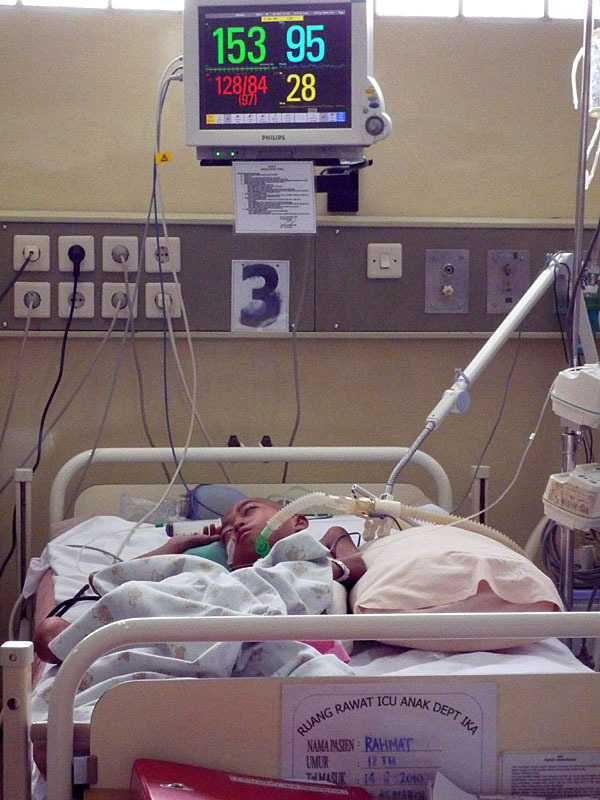 At the time of our visit both patients were being assessed but it is likely MCK will step in to help as Fauzi’s mum is unable to make it to the hospital due to financial worries, and Nur Oktavia will need expensive chemotherapy treatment. 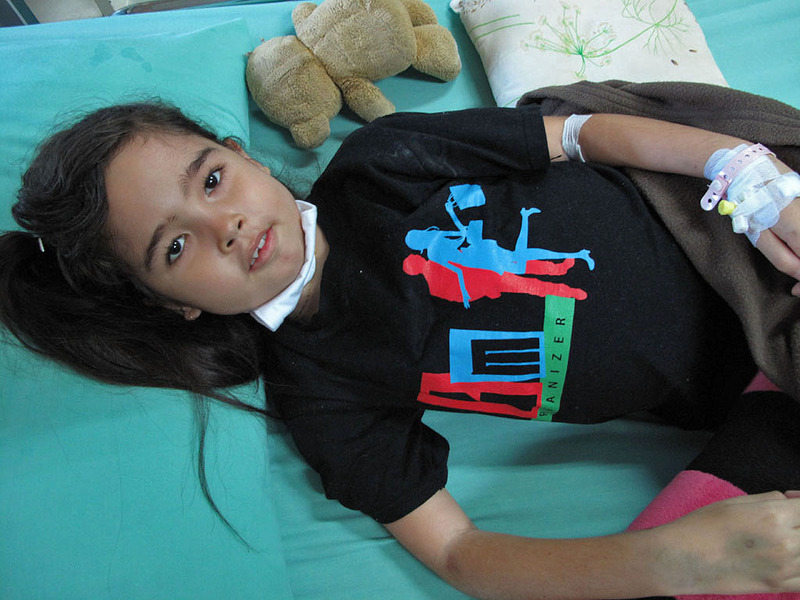 Many of the children on the ward are being helped by MCK. Lastly we visited the Infectious ward where we are helping with the treatment of almost all of the patients on the ward. 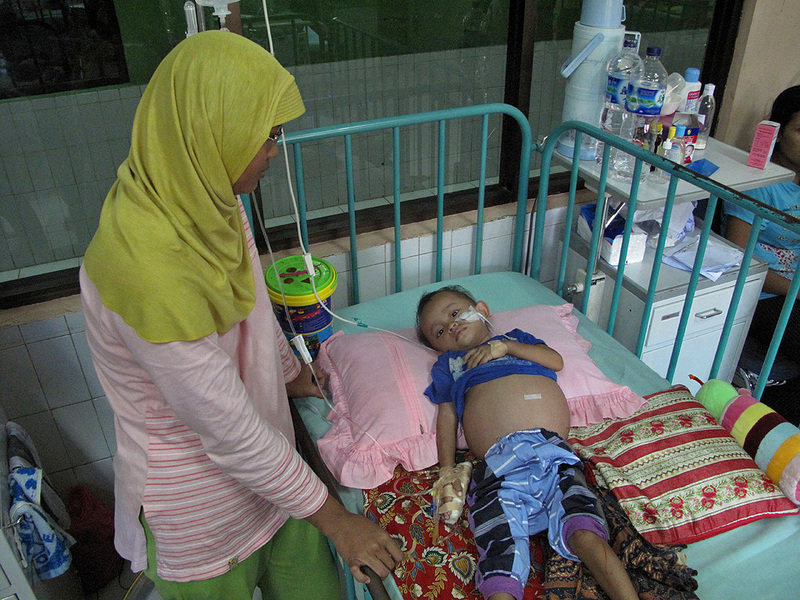 We met Rizky, who at 8 months old is suffering from meningitis. 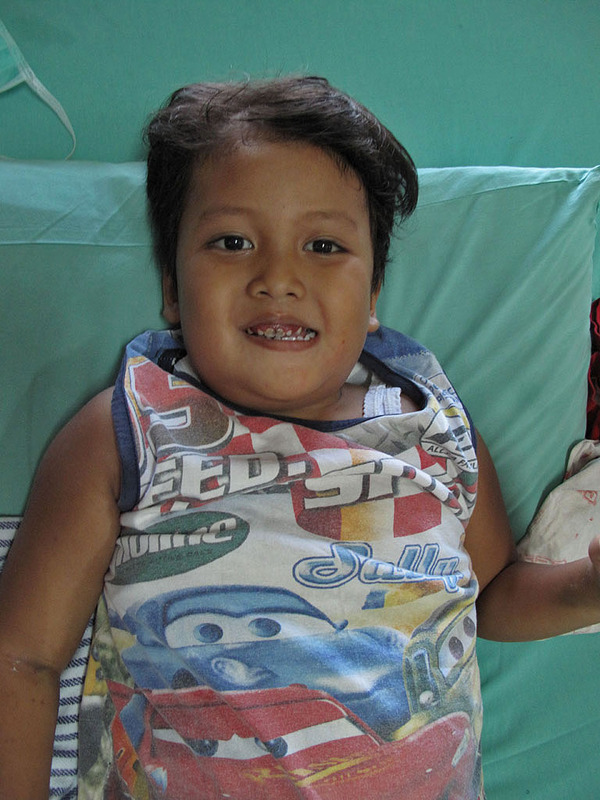 We are glad to report that Rizky is on the road to recovery. We also met Bilbina, 3 years old, who has pneumonia and HIV, and also Alexander, 4 years old, with malnutrition and HIV. We also met with Dhi Calyono who is 11 years old. She has a prolonged fever and cancer is supsected. A lymph node biopsy this week will confirm the diagnosis. For all of the babies, children and teenagers on the wards, we are so glad to be able to help you and your families. We wish you all lots of love and luck on your journey to recovery and beyond. It was one week ago when we went to visit Cipto Hospital. Barbara (from Die Bruke) joined our MCK volunteers, Sarah, Inge J, and Haidi for our regular hospital visit. We met a cheerful Rahmat! On his fifteen day of radiotherapy, he is bearing his treatment with such courage. Still on ventilation in ICU and severely malnourished, the doctors confirmed that the radiotherapy Rahmat has received is not shrinking the tumor on his lung. We await news on the next course of treatment for Rahmat. As we left, he waved goodbye with a smile and mouthed ‘terima kasih’ to us all. Still at the cancer ward, we met fifteen years old Dirda, who was happily playing with a mobile phone. She was admitted into hospital with chronic leukemia but it is suspected she has the acute form. She awaits a course of very intensive treatment. We wish Dirda all the best with her forthcoming treatment. 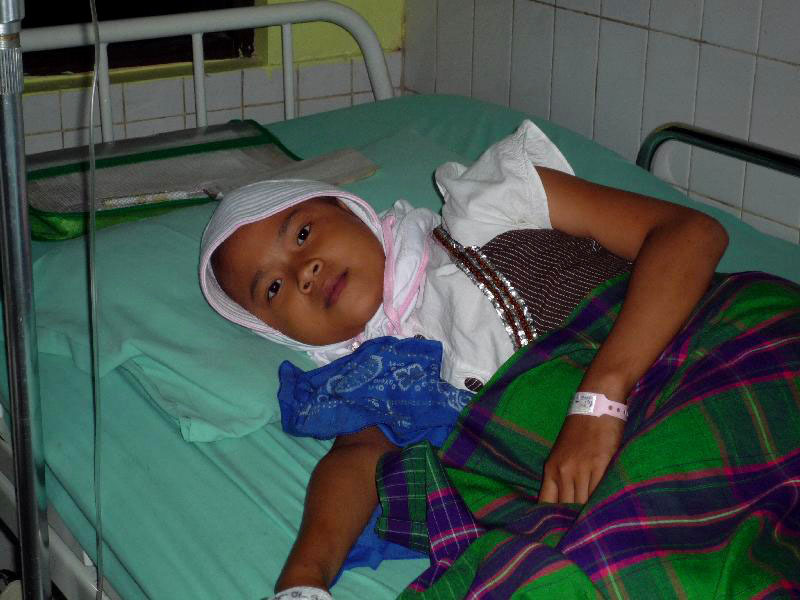 A further patient supported by MCK is Sakila, aged seven years old. She has a tumour of the bone in her leg. We wish Sakila strength on her journey through a long process of treatment. The cancer ward is undergoing some renovation at present. An isolation ward is being sectioned off at the end of the ward, but due to insufficient AC and funds the project is now on hold. Over at the Infectious Ward, we were introduced to one year old Ardelia, who we funded as a special case. She is diagnosed with HIV and is now quite malnourished so the government has stepped in to fund treatment. A second patient, five years old Rizki, has Steven Johnson Syndrome, Brochoneumonia, Anemia, Onicomycosis and Cornea Erosion. MCK has offered to pay for his medication as a special case, though the family want to take him home. 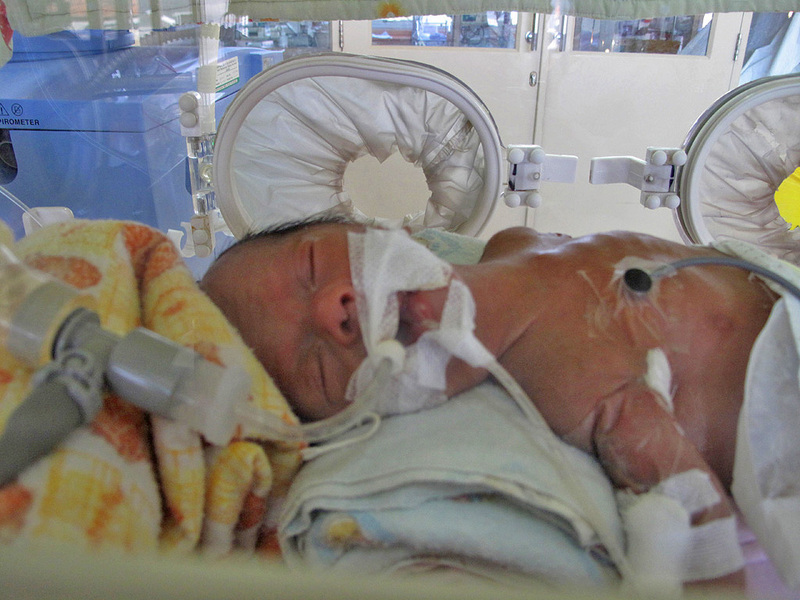 Lastly at the neo-natal ward, Rolita is the third baby from a set of triplets. Her siblings have already gone home and Rolita is well on the way to recovery. Born at just 1.3kg she is now 1.5kg and eight weeks old. As she overcomes her pneumonia we hope she is allowed to join her family very soon. We also met Oey Lina who is twenty seven days old. She has many problems with her heart and also suspected Downs Syndrome. She needs diagnostic tests and further monitoring. Her family have nothing and only wish to take the baby home. MCK has stepped in to help pay for the treatment that Oey Lina needs. We are so happy to hear that last month we managed to locate the family of baby Ahma who was abandoned by her mother. 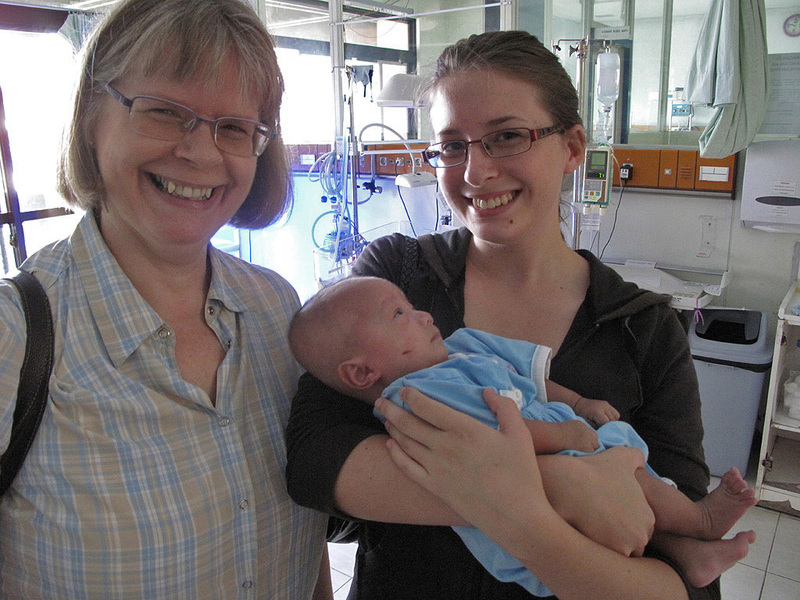 MCK’s volunteer Inge J and with the help of nurses from Cipto Neonatal managed to track down the family. Let’s hope baby Ahma gets all the love and attention for growing up. It’s been a month since our last visit at Cipto and today we met an array of patients that MCK are supporting. 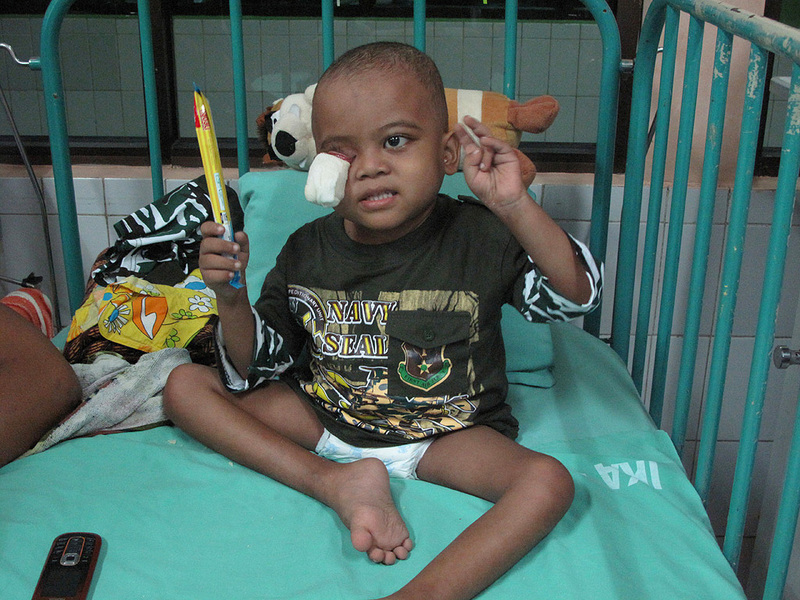 In the Infectious ward, Sahrul is 2.5 years old weighing only 5kg. He is suffering from severe malnutrition, Tuberculosis, and HIV (the latter being contracted through his mother). This is his second hospitalization and this time he’s been receiving treatment for two weeks now. Doctors are keeping a watchful eye on him. 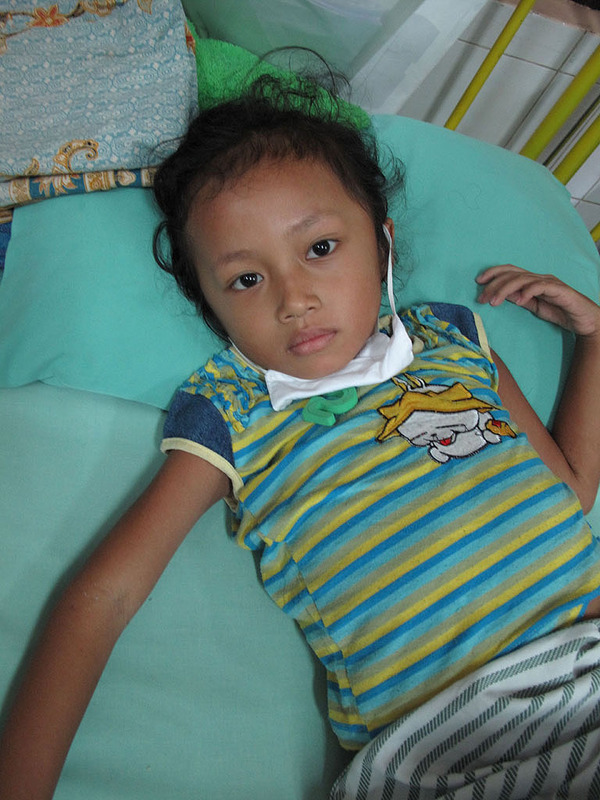 Pictured below is Jelsia who is nearly six years old with Congenital Heart Disease. Unfortunately she also has an infection in her brain resulting in her left arm and left leg partially immobile. She will be undergoing surgery this Friday to remove the infection in her brain. We send her warm wishes to stay strong. Subiatto is fifteen years old and we were sad to hear that he has been sick for five years now. He’s been hospitalized for four weeks suffering lung infection. Doctors have already operated on him to drain a lot of fluid out from his right lung. Currently on antibiotics, his condition is being monitored through lab checks to find out the cause of the lung infection. 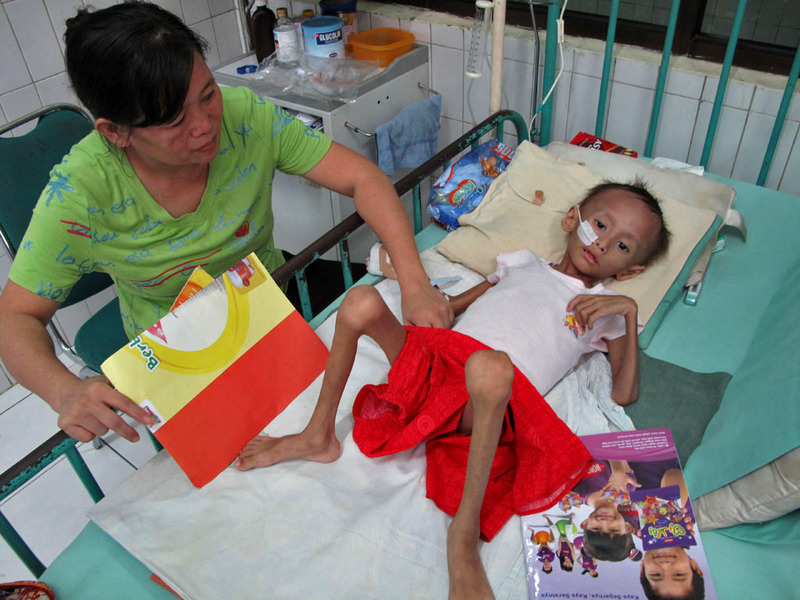 Two year old Sinta has Ascariasis (also known as worms) in her stomach. She was admitted two days ago in ER in which doctors found signs of worms in her vomit and faeces. She did not want to be disturbed but we were happy to hear that she may be able to return home to Cengkareng tomorrow. 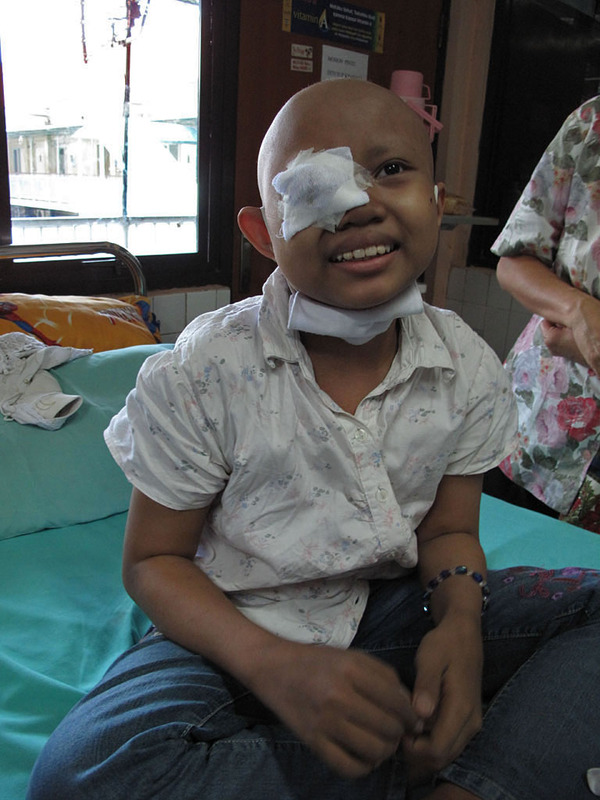 Over at the cancer ward, we met gorgeous looking eight year old Prichilla from Bogor. She is diagnosed with acute Leukemia and has been receiving chemo treatment for three weeks now. Next we met four year old Fajri suffering from acute AML. She was diagnosed one month ago and is now receiving the necessary treatment to get well. We adored her big smile when she allowed us to take a photo of her. Another girl we met with an adorable smile was eleven year old Dewi. She has Neuroblastoma (tumor found in her abdomen) and her eye problem came as secondary. Unfortunately her cancer is already in stage four. She was not shy to talk to us and proudly showed off her bracelet. We hope her well in her treatments. 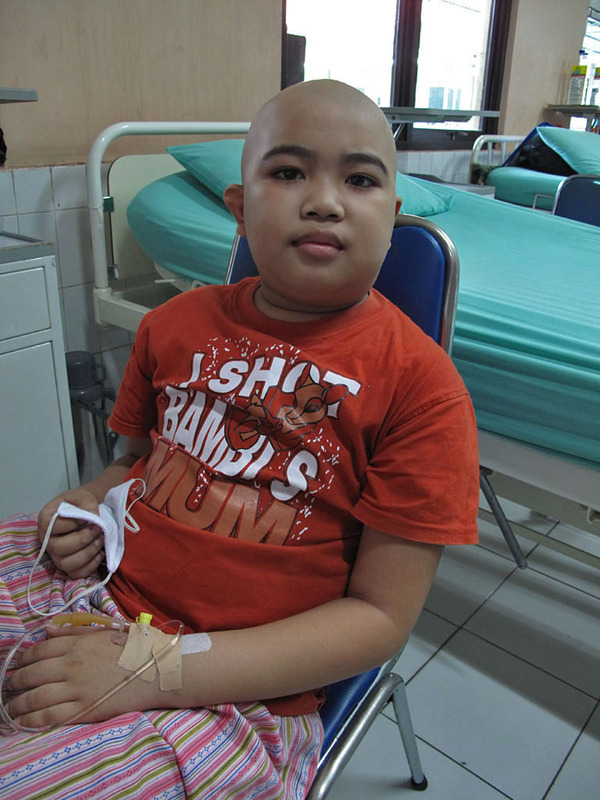 Ten year old Wawan is undergoing chemo treatment for Leukemia. Doctors class him as a high risk patient because of his poor response to the treatment. His mother told us he is the youngest in the family. 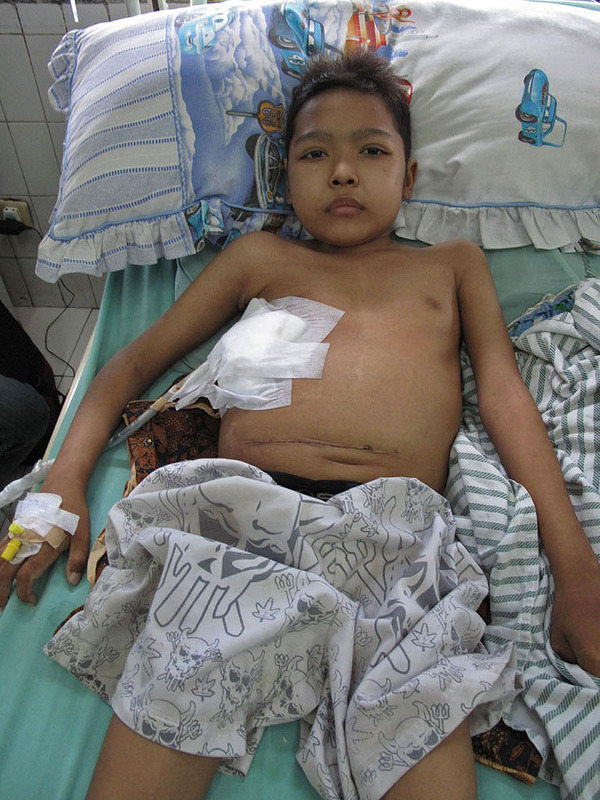 Another patient who we met in stage four of the cancer was eleven year old Yongki. He has cancer in the ear, nose and throat and the tumor has been spreading. Doctors cannot operate on him yet until the spread is controlled. He is undergoing chemo treatment which is helping. Lastly we met five year old Mutia from Bekasi with an unusual case of tumor in her liver (which normally occurs in adults). She has already been operated to remove the tumor and will continue with chemo treatment. At the Neonatal ward, we were very honored to have Dr. Rina showing us around. There was a special case of conjoined twins which had to be isolated in a special area. Both girls are joined on the hip bone. One baby is fit and well whilst the other is not doing so good. The twins can be separated as they don’t share the same organs but doctors are worried that the weaker baby may not survive so they have decided not to operate on them until the other gets well. Lastly we met the most tiniest baby so far. Born just seven hours ago, 26 weeks premature and weighing only 700gsm. 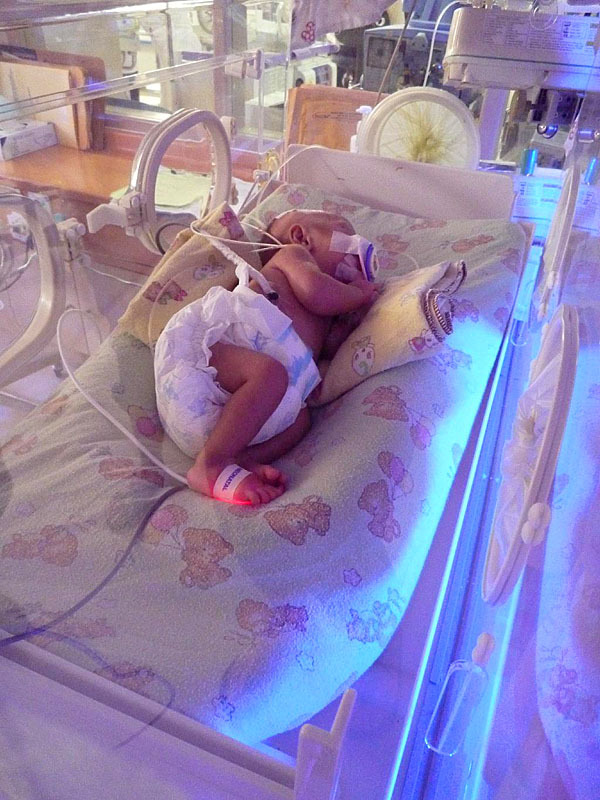 Baby Fitriani is suffering from problems in her lung and nurses had to help her with breathing apparatus. We had a very informative session over at the Neonatal ward and Cancer ward in Cipto today. Barbara and her daughter, Thordis from Die Brucke kindly joined us for the visit. 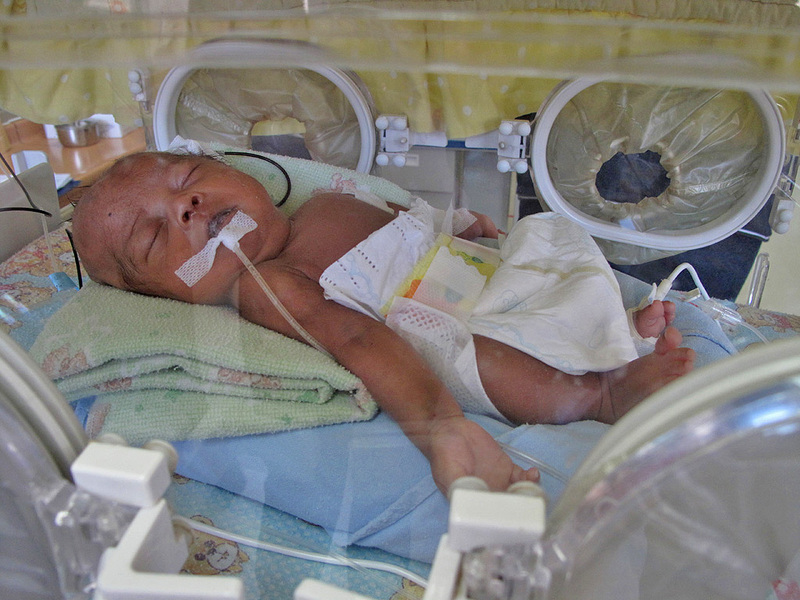 At the Neonatal ward, we met five new patients. Ibu Inge who showed us around mentioned there were currently fifty babies in the ward getting treatment and luckily not as busy as two weeks ago when we had visited. A pair of female twins recently admitted were thirty weeks premature. Both babies don’t have a name yet and are temporarily named after their mother’s name. Baby Nella 1 is doing fine but baby Nella 2 had difficulty in breathing and has undergone surgery about a week ago. They weigh 1,500 grams each and are slowly recovering. 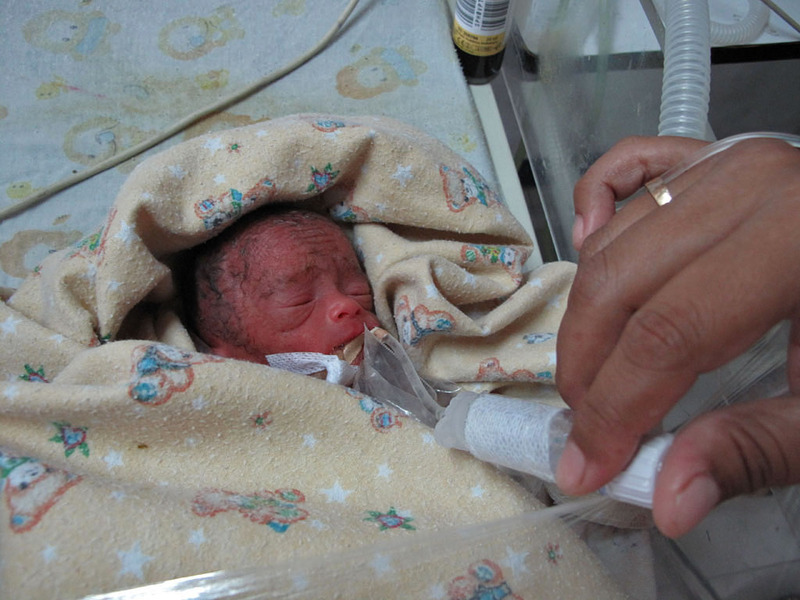 Baby Rahmawati (also temporarily named after the mother) is diagnosed with Gastroschisis. Only twelve days old, her current condition is not good and cannot be operated until she is more stable. We hope she stays strong and well. 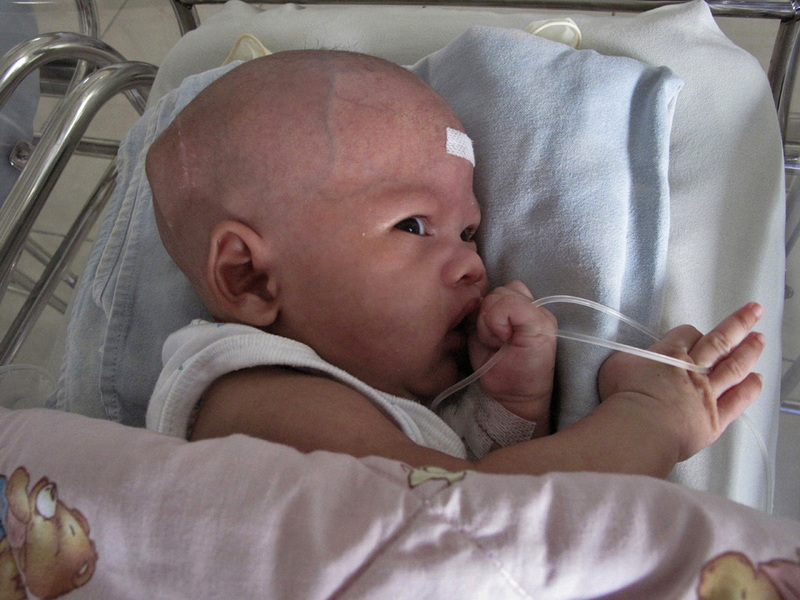 Baby Yulianti (also temporarily named after the mother) is suffering from Hydrocephalus. He has been operated for brain drainage to get rid of the liquid. Already admitted for one month in hospital and so far is doing good. When his condition is stable then his parents can take him home. We were sad to learn that there was an unclaimed baby who is only fifteen days old. The parents of Baby Ahma cannot be located and doctors have tried contacting them by telephone and had no success. With the help of the nurses, we will try to find the address of the family and see if we can do a house call. We hope there can be some clarification to whether the parents still want the child and if not then baby Ahma can be happily sent to an orphanage. Originally diagnosed with a blood infection, she is now fit and healthy and absolutely gorgeous looking. Thordis couldn’t resist giving a cuddle to baby Parin who we mentioned in our last visit. Over at the Cancer ward, we met Ana who is two years old and the youngest child out of two in the family. She is undergoing treatment for kidney cancer and is receiving Fosfamide chemotherapy. Already she has had one cycle of treatment and showed some good signs of improvement but her malnutrition was not improving. Ana will need one more cycle of chemo before she can be evaluated if they can do a CT Scan on her. We were told by the doctors that a CT scan is very expensive approx. IDR 2.5 million. We hope to be able to support Ana in any such way. Lastly we met Rendi who is all the way from Kalimantan. He is five years old and was not shy at all to chit chat with us. Happily nibbling on some candy and smiling away, he is diagnosed with Lymphoma and is at stage four of the cancer. One week of chemo treatment has already been received but there is another four more weeks of chemotherapy to come. His parents are here for three months to give Rendi love and support. We send our loving wishes too! This morning’s visit to Cipto Hospital was very good and informative. Melanie from the British Women’s Association kindly joined us for the visit. We managed to catch up with two of the doctors on duty who are forever busy. We are so grateful that they can even spare 5-10 minutes of their time with us. At the infectious ward, Dr Yoga updated us on two patients that MCK have been supporting. Rifdatul is nine years old and from Kota Bekasi. She is receiving treatment for Inflammatory bowel disease (IBD) and bone disease. 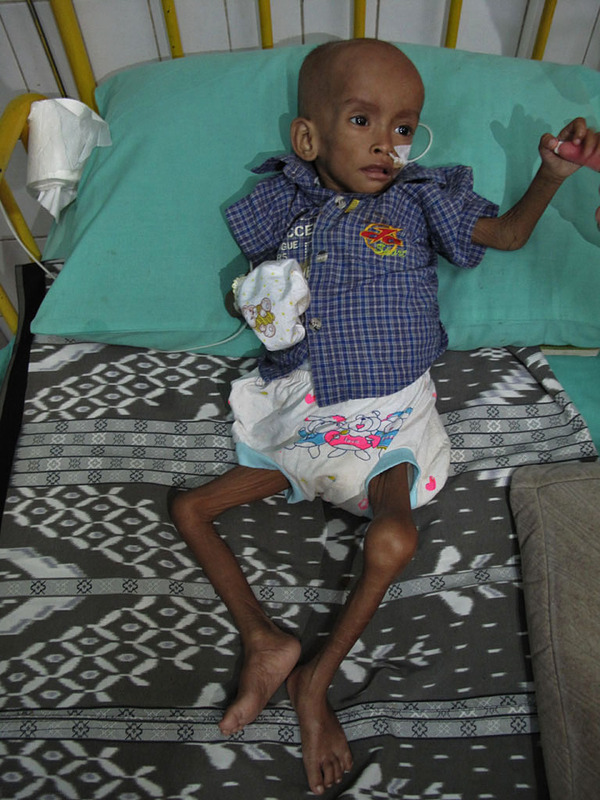 Currently doing very well after 3 months of treatment but is suffering severe malnutrition. Her bowel disease is more controlled now, her weight has slowly increased and there has been no signs of other infections. Weighing only 11.545kg, she remains in hospital to be monitored. 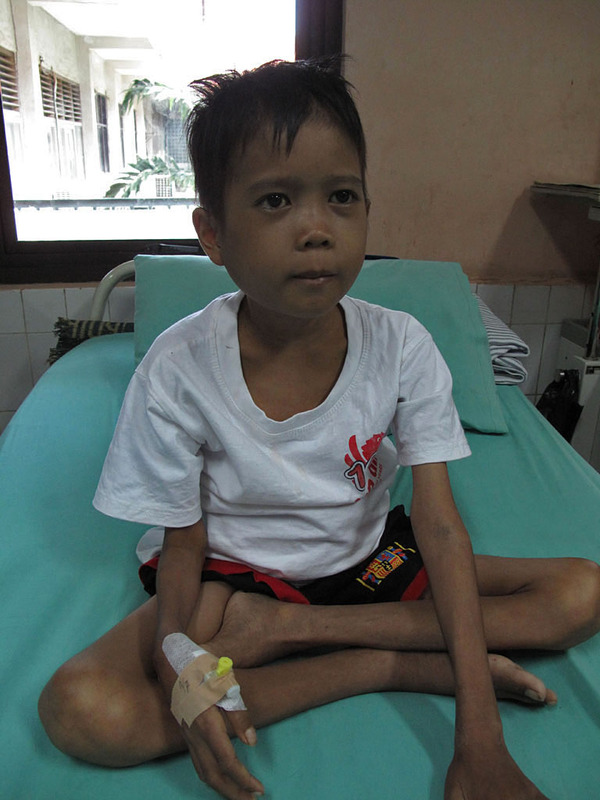 The other patient is Andreas from Tangerang who is suffering from HIV, malnutrition and Tuberculosis (TBC). Adopted at an early age, his mother tells us he’s now four years old. He has been receiving treatment for 7 weeks now, unfortunately we learnt that he was not doing well and had not gained much weight because the infection was not controlled yet. Let’s wish him all the best to get well soon. Over at the Neonatal ward, Dr Rina was ever so kind to show us around. We caught them on a very busy day with a surge of babies being treated. We even saw two babies unattended in a make shift room temporarily because all the other rooms were full. Dr Rina mentioned she was very grateful to all of our donors and that the money was spent on all the babies in the ward and not just to individual special case babies. 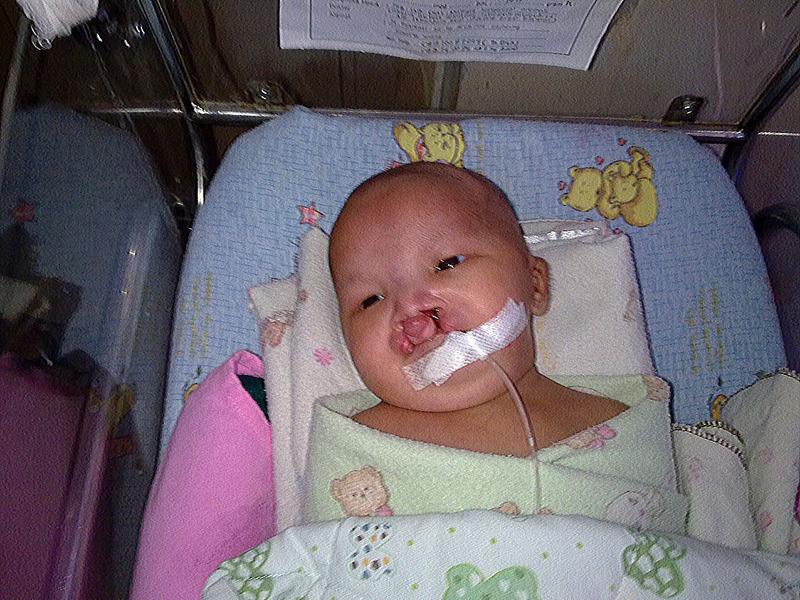 Baby Parin Alyanti pictured here has been in care since February this year. Currently is open for adoption and ready to be placed in an orphanage but is suspected of HIV. 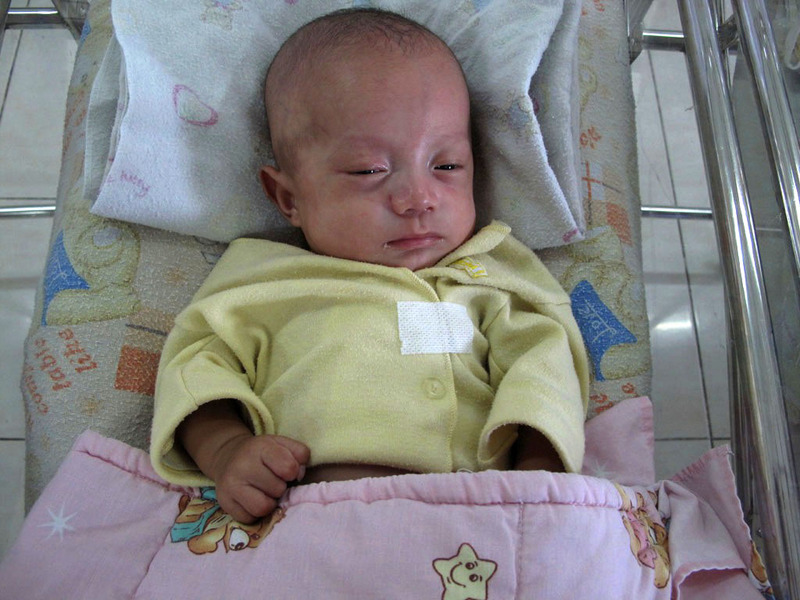 Baby Parin cannot be placed into an orphanage until a HIV test is performed when the baby reaches 6 months of age. This will then determine what special care is needed when the baby is released from hospital. We send warm hugs to stay healthy!